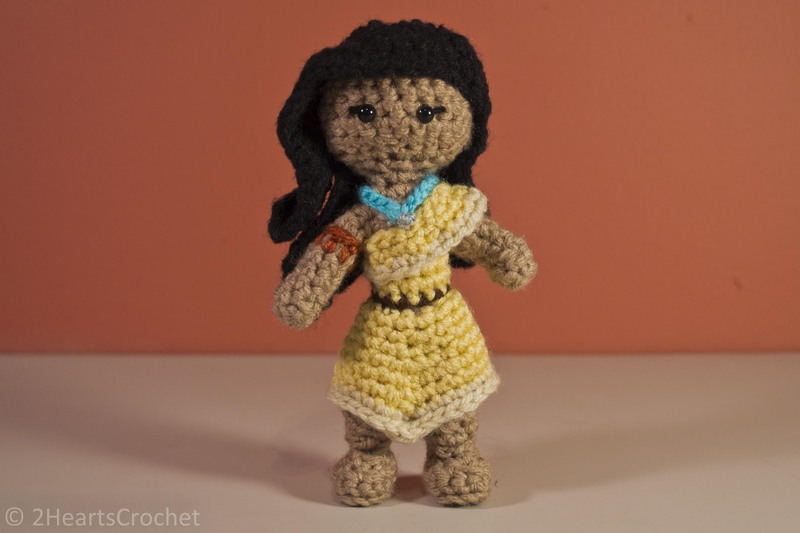 It took longer than expected, but I am thrilled to introduce this pattern for Pocahontas. She is a little tricky to work in some places, mostly because there are a few places where you are crocheting in tight corners. But if you can stick with it, the results are spectacular! This pattern uses 6mm saftey eyes. If you don’t have safety eyes, I’ve included instructions for making her eyes using yarn at the end of this pattern. Rnd 1: In tan, make a magic circle. Work 6 sc in the center of the magic circle. Join to beginning of the round & tighten circle. Ch. 1. Rnd 11: *sc2tog* – repeat around. Join & ch 1. Rnd 16: In cornmeal, *sc2tog* – repeat around. Join and ch 1. Rnd 19: sc around. Switch to brown, join and ch 1. Rnd 20: In brown, sc around. Join with a sl st, switch to tan and continue on to the legs. 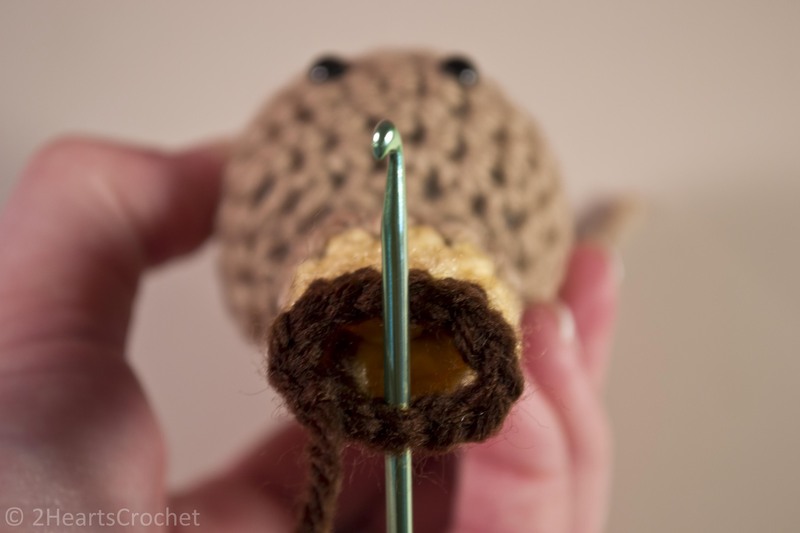 Rnd 1: In tan, working in the back loops only, insert the hook in the first st of the rnd 20 for the body/torso. See photo above for hook placement if needed. Work 1 sc in each of the next 6 sts. Ch 3. Join to the first st of this round. Ch 1. Rnd 2: Sc2tog, then work 1 sc in each of the remaining sts around for this leg. Join and ch 1. Rnd 3: Sc2tog, then work 1 sc in each of the remaining sts around for this leg. Join and fasten off. Begin second leg. Rnd 1: Insert hook into the seventh sc of rnd 20 for the body/torso (right next to where the chain stitches of the first round of the first leg begins to curve inward across the torso to form a circle) and ch 1. Work 1 sc in each of the next 6 sts. Work 6 sl st into the chain spaces of rnd 1 of the first leg (this joins the legs together). Join to the first st of this round. Ch 1. Rnd 2: Work 1 sc in each st around for this leg. Join and ch 1. Rnd 3: Work 1 sc in each st around. Join and ch 1. Continue to the remaining leg rounds. Rnds 4-5: Work 1 sc in each st around. Join and ch 1. Stuff the legs as you work; if you wait to the end, it will be much more difficult to get the filling into the legs! Rnd 10: Work 1 sc in each st around. Join and fasten off. Rnd 1: In tan, ch 6. sc in 2nd chain space from hook, sc, hdc, sc, 5 sc in last st of chain. Working on the other side of the chain, sc, hdc, sc, sc st in the last st. Join and ch 1. Rnd 2: Working in the back loops only, sc around. Join and ch 1. Rnd 3: Working in both loops, *sc2tog* – repeat around. Join and ch 1. Insert a small amount of stuffing into foot, but do not overstuff! Rnd 4: sc2tog, hdc2tog, sc2tog, sc2tog. Join and fasten off leaving a long tail. Using a tapestry needle and the tail ends of the yarn, stew the feet securely to the bottoms of the legs. Make sure you sew them on straight! Make a slip knot with the cornmeal. Insert your hook into one of the front loops of the brown belt (rnd 20 of the body/torso)—it doesn’t matter where you insert your hook, but I suggest you start at the back so that if you have a seam, it is less visible. Put the slip knot on your hook and pull through the brown loop. Ch 1. Rnd 1: sc around. Join and ch 1. Rnd 3: 2 sc in first st, 1 sc in each of the next 7 sts, 2sc in next st, 1 sc in each of the last 7 sts. Join and ch 1. Rnd 4: 2 sc in first st, 1 sc in each of the next 8 sts, 2 sc in next st, 1 sc in each of the last 8 sts. Join and ch 1. Rnd 5: 3 sc in first st, 1 sc in each of the next 9 sts, 3 sc in next st, 1 sc in each of the last 9 sts. Join and ch 2. Rnd 6: 1 hdc in first st, 1 sc in each of the next 12 sts, ch 1 and work 1 hdc in next st, 1 sc in each of the last 12 sts. Join and ch 2. Rnd 7: 1 dc in first st, 1 sc in each of the next 12 sts, ch 1 and work 1 dc in next st, 1 sc in each of the last 12 sts. Change to cream, join and ch 2. Rnd 8: 1 trc in first st, 1 sc in each of the next 12 sts, ch 2 and work 1 trc in next st, 1 sc in each of the last 12 sts. Join and ch 1. Rnd 9: Carefully sl st in each st around. Join and fasten off. Rnd 1: In cornmeal, ch 17. Lay the chain flat and place the doll on top of it so that the chain wraps around the doll from the back. 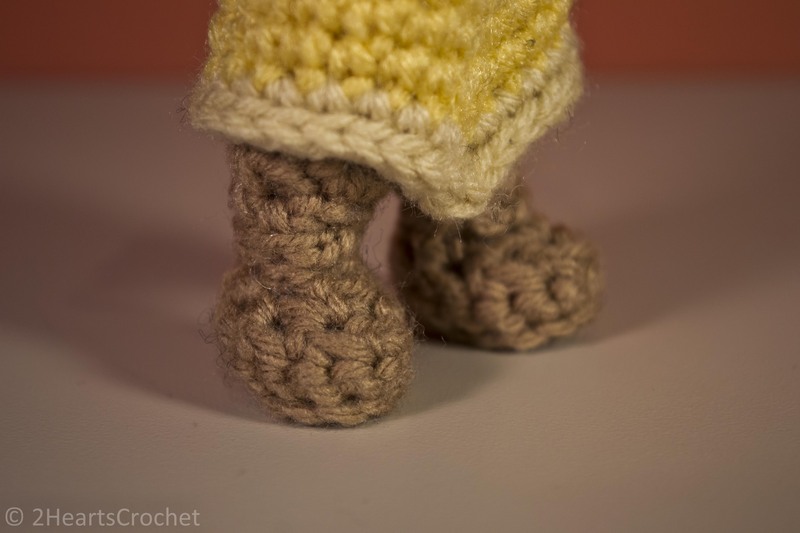 Make sure the tail end of the yarn is positioned on the doll’s left. 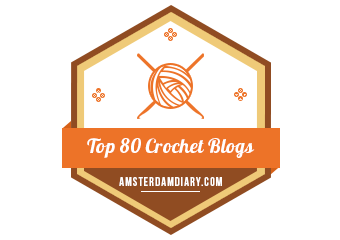 (You will basically join the ends of the chain together and crochet down. 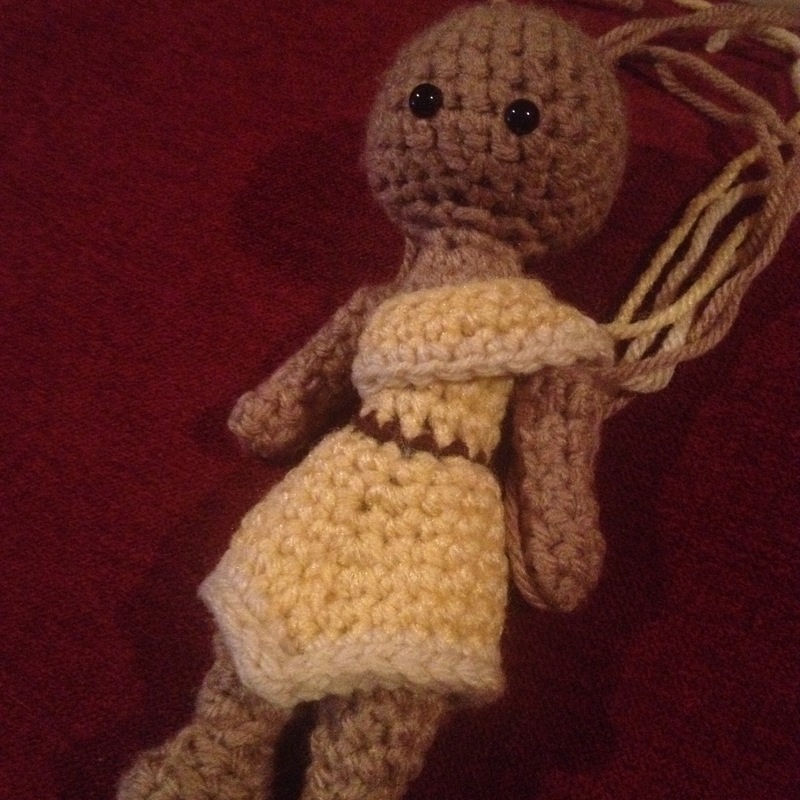 This piece is small enough that it will not slip on over the doll’s head or up from the feet, so you must crochet it around her waist and then slip it up into place by her shoulder.) Insert your hook into the first chain space (furthest chain from hook) and join – make sure your chain is not twisted! Ch 1. Rnd 3: Sc around. Join, change to cream and ch 1. Rnd 4: In cream, sc around. Join and fasten off. Move the shoulder/drapery detail piece up into place at the doll’s shoulder. Do not sew onto the body until you have sewn on the doll’s left arm under the drapery piece. Rnd 7: sc around. Join and fasten off, leaving a long tail. Use a tapestry needle to sew closed the remaining hole at the top of the arm. Sew the doll’s left arm onto the body, then sew the shoulder/drapery detail piece into place, and then sew the doll’s right arm onto the body. See photos for placement if needed. 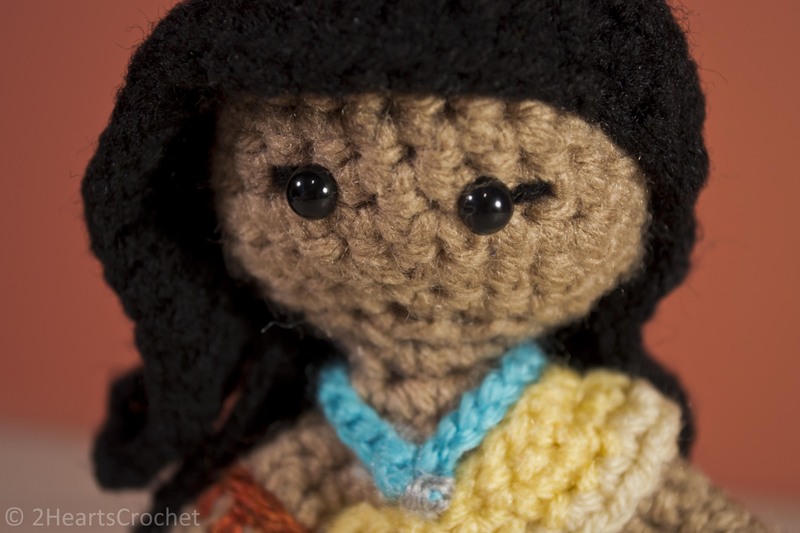 Using a strand of orange yarn and a tapestry needle, carefully stitch the tattoo details onto the doll’s right arm. See photos for detail if necessary. Rnd 1: In black, ch 26. Starting in the 2nd chain space from hook, work 1 sc in each st across. Ch 1 and turn. Rnd 2: Work 1 sc in each st across. Ch 1 and turn. Rnd 3: Work 1 sc in each st across. Join and fasten off, leaving a long tail. Rnd 1: In black, ch 23. Starting in the 2nd chain space from hook, work 1 sc in each st across. Ch 1 and turn. 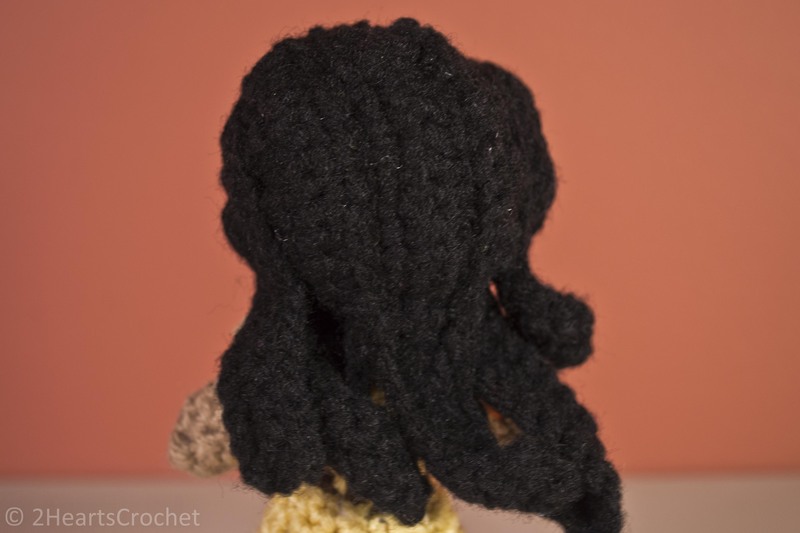 Note: If you want her hair to have a little less curl and be a little more true to the character, you may want to block these hair pieces before sewing them to the doll’s head. I did not opt to do this, but I kind of wish I had. Using a tapestry needle and the long tails, sew the long pieces of hair onto the doll’s head first, slightly further back than center. See photos for placement reference if necessary. Place one long piece in the back center of the doll’s head and one long piece on either side of this center piece. Stitch the pieces onto the head by sewing along both long edges of the pieces (rather than just down the middle). Then sew on the medium pieces, then the front pieces. Sew one medium piece slightly off-center on the doll’s left side. Sew this piece on by stitching along both long edges of the piece, like you did with the long hair pieces. Sew the last medium piece onto the doll’s right side, but only stitch along the edge that is furthest from the face. This leaves the side of the piece that is furthest forward open. Stitch closed the gap at the crown of the doll’s head. This makes it so that only half the piece is sewn on, allowing you to shape the rest of it to be more like bangs. See photos to get a better idea. Rnd 1: In turquoise, ch 12. Sl st in the 2nd chain space from hook. Ch 10 and fasten off. Using a strand of gray yarn and a tapestry needle, carefully knot a small knot at the front of the necklace in the center (this acts as the gray stone in her necklace). Carefully weave in ends and trim. 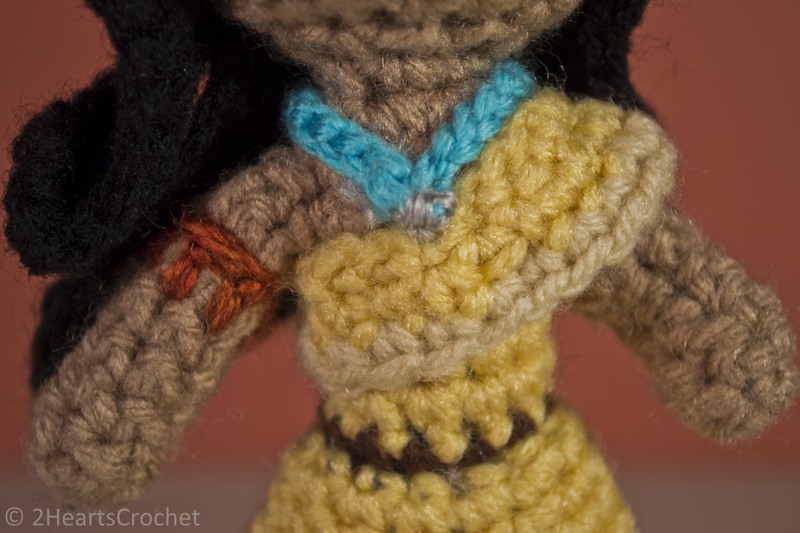 Tie the necklace at the back of Pocahontas’ neck and use a tapestry needle to stitch the back of the necklace down against the back of her neck and weave in ends. This keeps the necklace from moving about too much during play. You can also stitch the front of the necklace down, if you desire. Or, if you prefer, tie the necklace ends together, weave in ends, and leave the necklace free and floating. Take a strand of black 4-ply yarn and carefully split it into two strands (or use embroidery floss, if you have it). Using a sewing needle, carefully stitch a horizontal line at the edge of each eye to make the eyeliner. Weave in ends. I love every single detail about this doll. If anything, I might make her hair a little bit longer next time, but she turned out wonderful as it is.You can also make her a more defined belt if you like by working a chain that would fit around her waist and then stitching it to the body. So, what do you think? She’s my new favorite! I hope you enjoy her as much as I do! 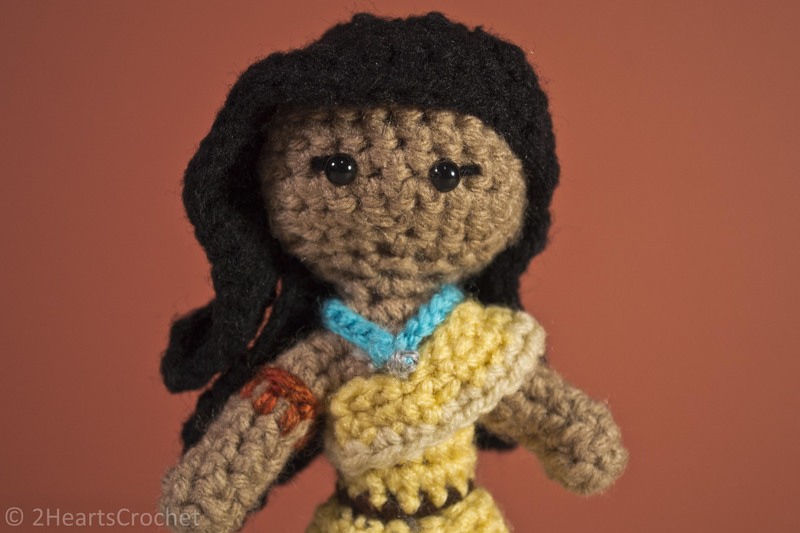 Next up, Mulan (who, thank goodness, will not have crocheted legs)! Hooray!